The Deep is a novella I have had on my list for a while. With Remembrance Day coming up, I thought it was the perfect time to read it. The Deep tells the story of twin sisters volunteering oversees during WWI. Through their eyes, we experience the atrocities of war, as well as the smaller, almost normal moments happening during a far-from-normal time. They administer to the sick and help to keep the morale of the soldiers up by offering them small comforts and company during their brief stints away from the front line. We do our work day by day and try not to think of the enormity of it. The destruction, the horror, the waste. And it seems like it will go on and on, until there are no young men left in the world. We wonder then if we did the right thing by coming here, by being part of it. The first thing that stood out for me, is that this is a story about the war from the perspective of women. There are so many stories about men and war, that the roles women played in the war can sometimes be overlooked. In addition, this is more than just a story about the war. The girls take time to reflect on their past and how it has shaped them; a mother who died, a father who was distant, older brothers who could be cruel, a caregiver who did her best, a teacher who had great hopes for them. It’s an interesting exercise, this recollection, the way it makes you remember more and more. Like opening a door, having no control over who walks through. The dark spreading stain on her apron pocket – it seemed that stain spread out slowly to cover our whole lives. The structure of the novella was interesting and made for a compelling read. The chapters narrated by the sisters (who are always together and refer to themselves as ‘we’), are alternated by the narrations of other people who they have come across in their lives; their Father, the Headmistress of their school, the woman in charge of the canteen in France, their brother, their caregiver, a doctor, and the Sentry who was the last man to have laid eyes on them. In this way, we get fragments of the story and must work to put it together; reading on, knowing that the next narrator will provide us with more information. Maybe that was the difference between us and Mrs. Moore, us and the men with their pockets full of photographs. Home for us was not exactly something to hold on to, it was something to figure out, to understand. The book is an examination of their lives, the chaos of the war, how one small thing can change everything, and the meaning of courage. The war changed many people’s lives, but this story is specific to them and the people who knew them, the experiences they had leading up to the war, and their reaction to the stress they were under by the time the war was over. In several instances in this book it takes just one small thing to change the course of a life, or lives. What if the soldier hadn’t turned his head right at that moment? What if they had just been able to say how they felt? What if she hadn’t told that tiny lie? It began to seem, after a time, that everyone had something. Had one thing that they’d seen or heard, that they couldn’t shake off, that they carried, would carry forever, like a hard, dull stone in the heart. I love the way The Deep is put together. It makes us think about the infinite number of stories that come out of wartime, and the infinite number of connections, perspectives and backgrounds. It also makes you think about how the direction of a person’s life can hinge on one tiny incident that can’t be undone, and how thinking about it and regretting it is futile; accepting it and moving on the only way, but not everyone can do that. Does that make some of us stronger than others? More courageous? Resilient? We talked then about whether or not it took more courage to live or to die, in such a situation. And argued a little; Hugh said one should always choose life, that was the only way for the human spirit to triumph. I’m happy to have finally read this novella, and highly recommend it. Now, I will have to go check out some of Mary Swan’s other work. The Deep is the winner of the 2001 O. Henry Award for short fiction. 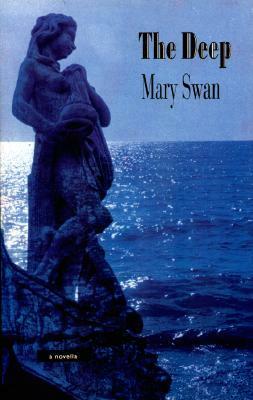 To learn more about Mary Swan and her other books, visit her website. Here’s an insightful review of The Deep at The Thoughtful Blogger. A friend of mine has written some wonderful stories about the homefront in WW2. Unfortunately she cannot get them published. I wonder how many good stories are out there about the war that may never get shared and read? Mary Swan’s novel, The Boys in the Trees, is one of the most wrenching books I have ever read. Similar structure to this one, from the sounds of things. I’ll definitely be seeking this novella out. Thanks! Oh, good to know! Sometimes I like a good gut-wrencher. Ooh, this sounds so good. I might try to squeeze this novella in before the month is over. I haven’t read anything by Mary Swan. It was good, and an easy one to squeeze in, as it is only 100 pages. I don’t know what took me so long to get around to this one.